The following is the full text of statement issued by the former President: “Prominent members of the government have been spreading rumours about billions of Dollars stashed abroad in secret offshore accounts by me, my wife and sons. The allegation is refreshed from time to time through strategically placed media reports about American and Indian financial intelligence bodies joining in the search and special teams being sent to the Seychelles to look for the hidden money. Some weeks ago, the cabinet spokesman had told Reuters that a member of a ‘leading family’ had $1064 million in a secret account in Dubai. ජනාධිපතිවරයා සතු විධායක බලතල සංවරණය කිරීමට යෝජිත 19 වැනි ව්‍යවස්‌ථා සංශෝධනය මේ දිනවල පුළුල් කතාබහකට ලක්‌ව ඇති මාතෘකාවකි. 19 වැනි ව්‍යවස්‌ථා සංශෝධනය යනු කුමක්‌ද? එයින් ජනාධිපතිවරයා සතු බලතල අඩු කරන්නේ කෙසේද? ජනාධිපති තනතුරට වැඩි බලතල ලබාදීම ජේ. ආර්. ජයවර්ධන ජනාධිපතිවරයා සකස්‌ කළ ආණ්‌ඩුක්‍රම ව්‍යවස්‌ථාවේ පදනම වූ බැවින් එම තනතුරේ බලතල අඩුකිරීම සමස්‌ත ආණ්‌ඩු ක්‍රම ව්‍යවස්‌ථාවට බලපාන්නේ කෙසේද? 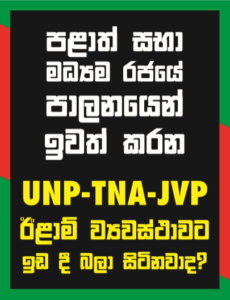 ජ්‍යෙෂ්ඨ අධිනීතිඥ ගෝමින් දයාසිරි කරන විග්‍රහයකි මේ.